B or b (pronounced /biː/ BEE)   is the second letter of the ISO basic Latin alphabet. It represents the voiced bilabial stop in many languages, including English. In some other languages, it is used to represent other bilabial consonants. Old English was originally written in runes, whose equivalent letter was beorc ⟨ ᛒ ⟩, meaning "birch". Beorc dates to at least the 2nd-century Elder Futhark, which is now thought to have derived from the Old Italic alphabets' ⟨ ́ ⟩ either directly or via Latin ⟨ ⟩. Anglo-Saxon runes are runes used by the early Anglo-Saxons as an alphabet in their writing. The characters are known collectively as the futhorc, from the Old English sound values of the first six runes. The futhorc was a development from the 24-character Elder Futhark. Since the futhorc runes are thought to have first been used in Frisia before the Anglo-Saxon settlement of Britain, they have also been called Anglo-Frisian runes. They were likely used from the 5th century onward, recording Old English and Old Frisian. 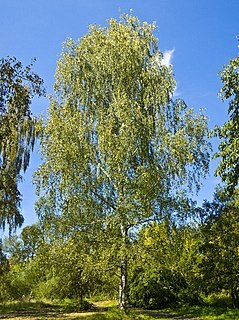 A birch is a thin-leaved deciduous hardwood tree of the genus Betula, in the family Betulaceae, which also includes alders, hazels, and hornbeams. It is closely related to the beech-oak family Fagaceae. The genus Betula contains 30 to 60 known taxa of which 11 are on the IUCN 2011 Red List of Threatened Species. They are a typically rather short-lived pioneer species widespread in the Northern Hemisphere, particularly in northern areas of temperate climates and in boreal climates. Uncial is a majuscule script commonly used from the 4th to 8th centuries AD by Latin and Greek scribes. Uncial letters were used to write Greek, Latin, and Gothic. The voiced labiodental fricative is a type of consonantal sound used in some spoken languages. The symbol in the International Phonetic Alphabet that represents this sound is ⟨v⟩, and the equivalent X-SAMPA symbol is v.
Ve is a letter of the Cyrillic script. The voiced bilabial stop is a type of consonantal sound, used in many spoken languages. The symbol in the International Phonetic Alphabet that represents this sound is ⟨b⟩, and the equivalent X-SAMPA symbol is b. The voiced bilabial stop occurs in English, and it is the sound denoted by the letter ⟨b⟩ in obey. Many Indian languages, such as Hindustani, distinguish between breathy voiced and plain. In an alphabetic writing system, a silent letter is a letter that, in a particular word, does not correspond to any sound in the word's pronunciation. Phonetic transcriptions that better depict pronunciation and which note changes due to grammar and proximity of other words require a symbol to show that the letter is mute. Handwritten notes use a circle with a line through it and the sound is called "zero"; It resembles the symbol for the "empty set", but must not be confused with the Danish and Norwegian letter Ø. In printed or computer's graphic presentation, the symbol is used. As /b/ is one of the sounds subject to Grimm's Law, words which have ⟨b⟩ in English and other Germanic languages may find their cognates in other Indo-European languages appearing with ⟨bh⟩, ⟨p⟩, ⟨f⟩ or ⟨φ⟩ instead. For example, compare the various cognates of the word brother. B is also a musical note. In English-speaking countries, it represents Si, the 12th note of a chromatic scale built on C. In Central Europe and Scandinavia, "B" is used to denote B-flat and the 12th note of the chromatic scale is denoted "H". Archaic forms of 'b', the b quadratum (square b, ♮) and b rotundum (round b, ♭) are used in musical notation as the symbols for natural and flat , respectively. An alphabet is a standard set of letters that represent the phonemes of any spoken language it is used to write. This is in contrast to other types of writing systems, such as syllabaries and logographic systems. Beta is the second letter of the Greek alphabet. In the system of Greek numerals it has a value of 2. 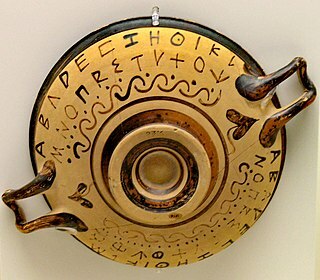 In Ancient Greek, beta represented the voiced bilabial plosive. In Modern Greek, it represents the voiced labiodental fricative. Letters that arose from beta include the Roman letter ⟨B⟩ and the Cyrillic letters ⟨Б⟩ and ⟨В⟩. The voiced bilabial fricative is a type of consonantal sound, used in some spoken languages. The symbol in the International Phonetic Alphabet that represents this sound is ⟨β⟩, and the equivalent X-SAMPA symbol is B. The symbol ⟨β⟩ is the Greek letter beta. Be is a letter of the Cyrillic script. It commonly represents the voiced bilabial plosive, like the English pronunciation of ⟨b⟩ in "bee". It should not be confused with the Cyrillic letter Ve (В в), which is shaped like Latin capital letter B but represents the voiced labiodental fricative. The history of alphabetic writing goes back to the consonantal writing system used for Semitic languages in the Levant in the 2nd millennium BCE. Most or nearly all alphabetic scripts used throughout the world today ultimately go back to this Semitic proto-alphabet. Its first origins can be traced back to a Proto-Sinaitic script developed in Ancient Egypt to represent the language of Semitic-speaking workers in Egypt. This script was partly influenced by the older Egyptian hieratic, a cursive script related to Egyptian hieroglyphs. ↑ It also resembles the hieroglyph for /h/ ⟨ ⟩ meaning "manor" or "reed shelter". ↑ "B Button Emoji ". Know Your Meme. Retrieved 4 December 2018. ↑ Constable, Peter (30 September 2003). "L2/03-174R2: Proposal to Encode Phonetic Symbols with Middle Tilde in the UCS" (PDF). ↑ Constable, Peter (19 April 2004). "L2/04-132 Proposal to add additional phonetic characters to the UCS" (PDF). ↑ Everson, Michael; et al. (20 March 2002). "L2/02-141: Uralic Phonetic Alphabet characters for the UCS" (PDF).